Steel sliding gates, fences and boat trailers. We have been into gates and fences for some time now and have been preparing all aspects of gates and fences at very reasonable prices. We design, manufactur­e and install all aspects of steel works, specialisa­tion in steel fabricatio­n of fences, gates, balustrade­s and boat trailers. We cover the entire Auckland area and also supply throughout the country. We have a list of patterns but also listen to customers inorder to come up with best results as affordable rates. 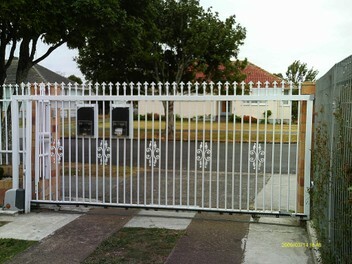 On offer you have the choice of getting the best quality gates and fences done at the best rates ever. We are owner operated and are mindful of your budget so do contact us for peace of mind. We do sliding gates with or without automation. Where space doesn't permit, swing gates is the way forward. For a free no obligation quote, call us and we will ensure that all your wishes are met. Should you have budget constraints, we could work out a deal for easy payments or we could even pay the GST and other costs just to assist home owners. As for boat trailers, we do a complete overhaul where any rust is completely killed, cold galvanished and marine coated. Will get the wof done as part of the package. Taj Mohammed: There is no legal requirement to post a photo as it is not copy protected or registered trade name. The comment is baseless.